Traditional monetary policy, as practiced in the decades up to 2007, faces a problem looking ahead. The shared areas in this figure show recessions. 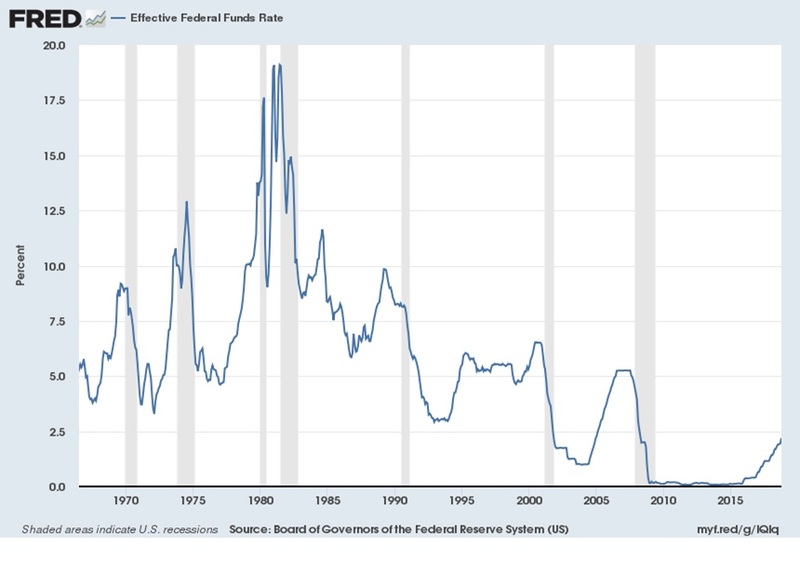 During a typical recession, the Federal Reserve cut its policy target interest rates--the so-called federal funds rate--by about 5 percentage points. 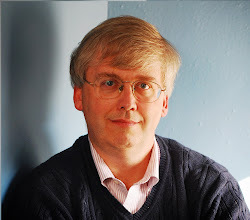 There are underlying reasons why these policy interest rates have trended down over time, not only in the US but all over the world: a combination of continuing low inflation and also a combination of supply-and-demand forces in global markets like the "global savings glut" of high savings in China and other Asian countries. But whatever the reasons why policy interest rates or lower, the problem remains: When the next recession hits, reducing the the policy interest rate by the traditional 4-5 percentage points will be impossible. The same issue applies to major central banks all around the world: the European Central Bank, Bank of England, Bank of Japan, and so on. So the Federal Reserve and other central banks are likely to turn to the same set of policy tools they used in the previous recession: specifically, to the "quantitative easing" tool in which a central bank expands the money supply by direct purchases of financial assets. For the Federal Reserve, this has meant purchases of US Treasury securities and some mortgage-backed financial securities. In other countries, it has sometimes included purchases of other private sector financial securities, too. For an overview of how these tools of unconventional monetary policy work, I recommend the two-paper symposium in the Fall 2018 issue of the Journal of Economic Perspectives (full disclosure, I'm the Managing Editor of the journal). Kenneth Kuttner focuses on US experience and Federal Reserve decisions in "Outside the Box: Unconventional Monetary Policy in the Great Recession and Beyond" (32:4, pp. 121-46). Giovanni Dell'Ariccia, Pau Rabanal, and Damiano Sandri focus on three other major central banks in "Unconventional Monetary Policies in the Euro Area, Japan, and the United Kingdom" (32:4, pp. 147-72). For those who prefer to absorb this content by watching video, the authors presented their papers at at conference held at the Hutchins Center on Fiscal and Monetary Policy at Brookings on October 17. Video of the presentations is available here. Slides are available here. Kuttner's 15-minute presentation of his paper on the Fed may work especially well for US economics classrooms. 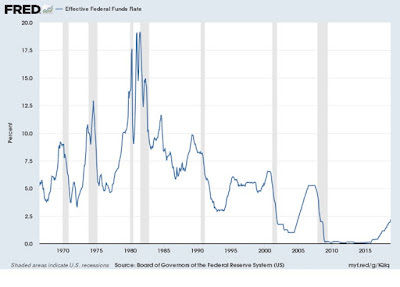 "A preponderance of evidence nonetheless suggests that forward guidance and quantitative easing succeeded in lowering long-term interest rates. Studies using micro data have documented tangible effects of quantitative easing on firms and financial intermediaries. Macro models suggest that the interest rate reductions are likely to have had a meaningful impact. The adverse side effects appear to have been mild, and are dwarfed by the costs of the more protracted recession in the United States that likely would have occurred in the absence of the unconventional policies. The benefits of unconventional policy therefore probably outweighed the costs. "Some questions are not entirely settled. First, the persistence of the effects on interest rates remains unclear. Second, disentangling the effects of quantitative easing from those of forward guidance is difficult. Third, the effects of these policies may have been in part a function of turbulent financial conditions, or may have diminished over time as the novelty wore off." Finally, for another nice recent over view of quantitative easing, how it works, and what is likely to happen next time, interested readers might turn to "QE: A User’sGuide," written by Joseph E. Gagnon and Brian Sack (Peterson Institute for International Economics, Policy Brief 18-19, October 2018).